One week in Berlin, searching for the unknown. As the Black Mountain College did we meet this project as a way of living. Questions that appear circle around what to do in the time that we have. Both inside and outside the museum, and inside and outside of ourselves. Photo by Nikoline Spjelkavik. Drawings by Freya Sif Hestnes of the performances of the texts. Jonas Løvstrøm Borgensgaard practicing on the Theremini. Similar to certain functional love relationships we’ve experienced being together in the same space without doing the same all the time. Sometimes one could get a spin off each other creatively, and sometimes one finds things to do together. The space demands stillness, due to the context of being in a museum and also because of the acoustics giving a foggy soundscape and sound that travel very well. This again creates the need to break this and do a lot of activity and make the space more vivid. Pic 2 by Viola Tømte. 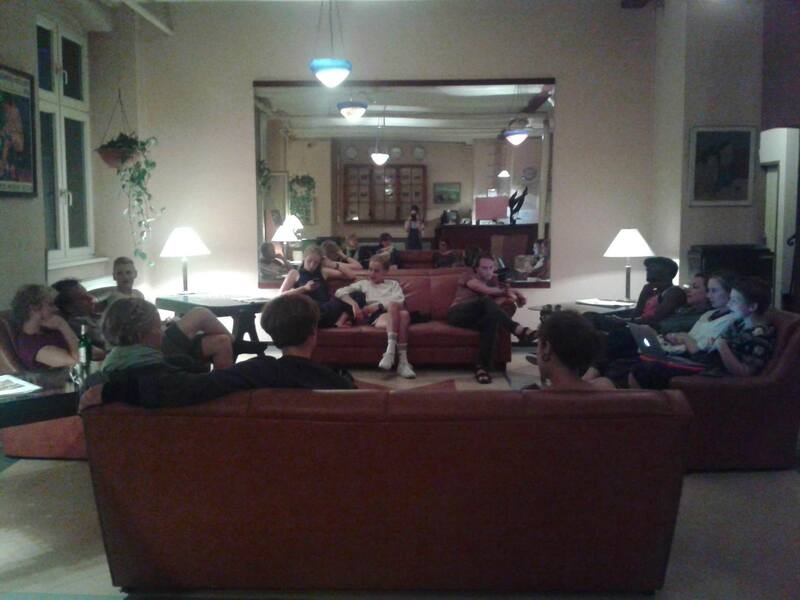 The whole gang in Die Fabrik Hostel. What is the connection between scientific research and art? We’ve visited both the Technology Park Adlershof and Bard College and learned about the important environmental friendly inventions in the concrete business in some of our curated excursions outside of the museum. Science often starts with question and works through them, then poses new questions. In our study at the Norwegian Theatre Academy we’re trained in meeting a place and see what questions are there. Questions that keeps reappearing here in the museum are about how to meet the visitors. Shall we attempt to give them new experiences, factual knowledge, real meetings between people or space to search themselves? The different text in the archive has different qualities and timing. Some texts are directed to a concrete person, like a letter, that makes it easier to follow even though the visitors don’t hear it from it’s start. While some texts are important to explain what is to give the visitors a relatable frame. One important approach for us is allowing the present to appear and letting moments happen. As the architect Le Corbusier (whom’s architecture we’ve also visited) found during his research: cubistic shapes are empty and non-functional without a social consideration. Photo by Mari Lassen-Bergsten Kamsvaag. Marina Popovic at the Heavy Load Bearing Body. Photo by Mari Lassen-Bergsten Kamsvaag. Tobias Shaw Petersen in Technology Park Adlershof. We’ve gotten a friend in the artist Ido Nahari, who has been part of the text delivery once and will join us once more Tuesday 1st of September! Photo by Elizabet Damyanova. Ido Nahari, Katrine Leth Nielsen and Mari Kamsvaag. In the text Mulenga Mwansa found a history about a boy who had misbehaved in the BMC.The faculty asked him: Why are you here? In connecting the philosophy of the BMC with the exhibition now Mulenga has posed this question for the visitors. A lot of answers have appeared! There has been several improvised performances occurring. One dance performance including one of the museum’s guards on piano, Marina Popovic and Katrine Leth dancing and Mari Kamsvaag on theremini. One collaboration between Tobias Shaw Petersen, Anders Tougaard and Mulenga Mwansa dancing, making sounds and playing the piano, Viola Tømte singing and Robert Johanson playing the theremini. live model drawings of the people reading out archive texts from the score. Documenting all of the readings two hours at the time. 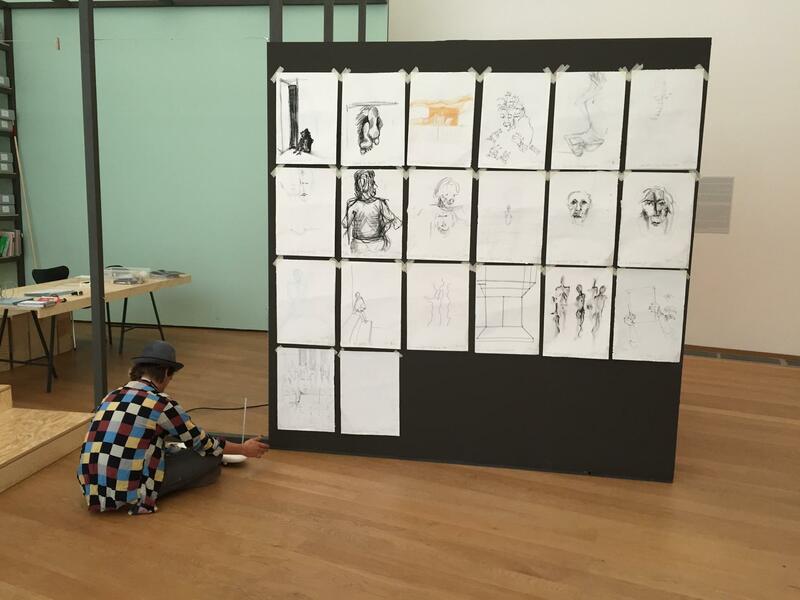 All the drawings are named with the title of the text that is being read, the beginning time and the duration of the drawing (between 1-8 mins). Listening to some selected readings, paraphrasing it simultaneously on the typewriter in real time, writing selected sentences intuitively. The collection of texts will form a new, poetic archive. 7b Photo by Mari Lassen-Bergsten Kamsvaag. Whisteling concert. Mari Kamsvaag, Victoria Røising, Nikoline Spjelkavik. Photo by Elizabet Damyanova. Mari Kamsvaag jamming with a baby and the mom. Photo by Elizabet Damyanova. Freya Sif Hestnes playing the piano. Photo by Viola Tømte. Rebooth and reflection. 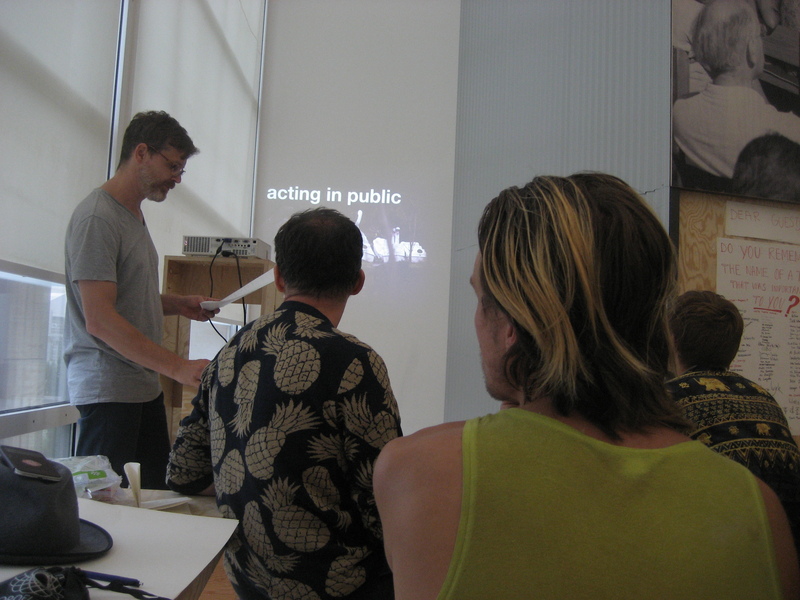 – Raumlabor Berlin: Christof Mayer and Florian Stirnemann giving a lecture about their architecture in the museum space and of some of their projects in their architecture collective. Photo by Mari Lassen-Bergsten Kamsvaag. Christof Mayer and Florian Stirnemann giving a lecture about Ramlabor Berlin.